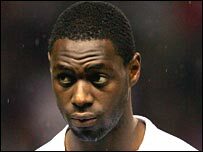 Tottenham captain Ledley King is to have knee surgery after aggravating a cartilage tear when on England duty. The 26-year-old defender has only just recovered from foot problems that restricted his appearances in the second half of last season. Spurs manager Martin Jol said: "It's a routine operation and it makes sense for Ledley to have it now and use the summer to recover." King recently played for England against Brazil and Estonia. He had knee surgery last summer and missed the start of the campaign, helping Spurs get back on track after their slow start to the season. After picking up his initial foot injury - which then became a problem for both feet - he was earmarked for a return as early as the end of January, but it took him until April to make his comeback. Despite not being 100% fit, he helped Spurs finish the Premier League season in fifth place, securing UEFA Cup qualification for consecutive seasons. "At first I thought I was going to be out for a couple of weeks so to miss four months was tough to take," he said after making a comeback. "Every two weeks I thought there was a chance to be back. The foot was never ready and it was both feet in the end."